_____John Wyndham�s science fiction novels, in this instance The Chrysalids and The Day of the Triffids, do not focus on incredible and unbelievable developments in technology, as do novels of many of the stereotypical science fiction writers, yet instead focus on how the people; particularly the protagonist, deal with the many uncomfortable situations they are faced in the frightening world of the future. _____The Day of the Triffids is perhaps Wyndham�s best known novel, and tells of explosions in space blinding a large proportion of the population, at the same time as an agricultural experiment goes horribly wrong, and millions of triffids, carnivorous plants, populate every corner of the globe, threatening mankind�s very existence. In The Day of the Triffids, Wyndham speculates on many things. He contemplates how the people would deal with wide-spread blindness, and how they would accept the danger of carnivorous plants on the loose - not a contemporary invention, simply basic biology working against us. In his writings he considers how the remaining people of the world would deal with such a situation, that changing situations do require new ways, and what new ways would gain acceptance. 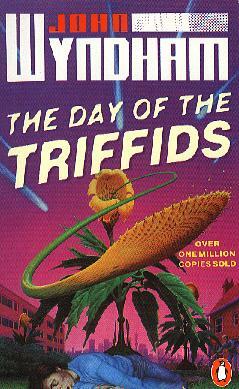 _____Speculation about how people would react widespread blindness is an integral part of The Day of the Triffids. Wyndham considered what the consequences would be; that most of the population would die of starvation because of their inability to carry out normal daily tasks such as buying the groceries and preparing meals without the assistance of a person with twenty-twenty vision, not to mention the overhanging danger of the triffids. Wyndham uses quotes such as that above to allow the reader to consider what the consequences would be, and also to work on the conscience of the receiving character. Wyndham considers how the people of the world would cope in such a disastrous situation with an overwhelming majority of the population being blind, where the small proportion still sighted are relied on by numbers of one thousand to one for the survival of the human race. He focuses on the devotion and responsibility it would take, to in effect, save civilization as we now know it. _____Wyndham�s consideration of what would happen if carnivorous plants capable of killing humans were loose develops into a primary issue throughout the novel. Coupled with widespread blindness, those with vision defects would undoubtedly be stung by a triffid if not already dying of starvation, a situation which progresses into the biggest conflict in the novel. This excerpt indicates the helplessness felt by the rescuers, and how widespread the problem was. He considers the devotion and selflessness that people such as Bill felt, and uses this to reflect on the strength of character exhibited by the heroes of the era in which the book was written. _____The Chrysalids is another of Wyndham�s novels; the tale of a society who have survived a nuclear war, Tribulation, however the high levels of radiation arising from the war have contaminated the living parts of the biosphere. 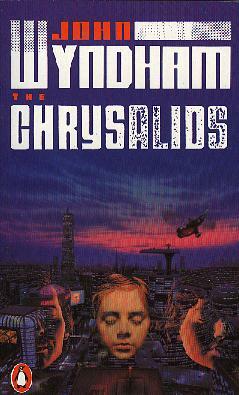 In The Chrysalids, Wyndham uses not new technology, but ultra-conservative religious views to create the conflict in his futuristic town of Waknuk. The conflict expressed in this novel was the bigotry and antipathy for anything which did not correspond with the �norm,� illustrating the use of strange customs to set the scene, in preference of the stereotypical space or time travel. _____Bigotry and ignorance are the key conflicts in The Chrysalids, and Wyndham uses the intolerance for any de-formed or telepathic being to correspond with intolerance in our society to due colour, race or creed. The ultra-conservative views of Joseph Strorm are designed to relate to Twentieth Century intolerance such as the 1930-40�s persecution of Jews in Germany under Hitler, The Klu Klux Klan, and anti-white sentiments in certain areas of the United States, such as Harlem or Miami. _____Sentiments such as those put forward by Joseph Strorm in the form of the signs reading phrases of antipathy like �ONLY THE IMAGE OF GOD IS MAN,� �WATCH THOU FOR THE MUTANT!� and �THE NORM IS THE WILL OF GOD� are used by Wyndham to reflect on how his futuristic community of Waknuk is sadly in many ways a clone of the society of today. _____One of the clearest notions the novel presents for the fear of Mutants is Joseph Strorm�s dislike for the over-sized horses - something which could have benefited the community. This prejudice, solely on the grounds of appearance, illustrates the hatred Strorm had for anything that did not correspond with the norm, even if, as in this case the deviation could have worked to the advantage of the community at large. _____As the novel develops, David discovers that he and his peers are too deviants; yet their mutation is not as obvious as that of Sophie�s - David discovers that he possesses an outwardly undetectable yet astonishing deviation, that of mental telepathy. While the bigotry shown by the community against the so called �Fringe� people is despicable, the greatest intolerance of all is when parents turn against their own child; which was what happened to David. Wyndham�s purpose for creating this conflict was to give the reader a greater understanding to how widespread and unjust the narrow-mindedness in Waknuk was. _____The novels The Day of the Triffids and The Chrysalids are both prime examples of Wyndham�s unique style of writing. Wyndham�s 1950�s novels heralded the dawning of a new era in science fiction, for he was the inaugural writer of what is now widely known as speculative fiction, a division of the science fiction genre. Speculative fiction, hence the name does not necessarily concentrate on amusing the reader with illogical tales of space or time travel, but involves plausible fiction based on rational extensions of the present day, which is the genre which The Day of the Triffids and The Chrysalids belong.